A photograph can’t capture people’s voices, so it fails to convey what people say about themselves. However, what people say doesn’t always accurately reflect what they are actually thinking and feeling. In fact, people sometimes use verbalizations to modify, filter, and censor the expression of what goes on inside them. Many psychologists believe that non-verbal communication reveals as much, or more, than talk. The physical appearance of people, the way they dress, how they move and position themselves, speaks volumes. Much of what happens with body language is actually unconscious. People can monitor and control it to a certain degree, but often their physical movement conveys their feelings when they aren’t verbalizing them, even when they don’t want to or can’t verbalize them because those feelings are unconscious. For example, research suggests that people, without even realizing it, lean slightly forward when thinking about the future, and slightly backward when thinking about the past. The body doesn’t know how to lie. Although a photograph cannot record body movement over time, as does video, it excels in portraying the essence of a person disclosed through body language at a particular moment in time. It can capture a physical expression that might last only a second, that otherwise might go unnoticed in the stream of a person’s movement. Photographers who like to photograph people might benefit from familiarizing themselves with the basic body language patterns that portray particular emotions and mental states. A cluster of physical signals make up a pattern, which more reliably expresses a person’s mental state than a single aspect of body posture. Photographers might use this knowledge to recognize a revealing moment to capture, or to direct models into a psychologically intriguing pose. Although these categories overlap, it’s helpful at first to think of them as relatively distinct states of mind. Aggression: Frowning, snarling, baring teeth, staring, with redden face, rigid body, clenched fists, and large, threatening and insulting gestures, you display unexpectedly sudden movements, intrude on someone’s space, and deliver unwanted or hostile body contact. Deceptiveness: With a tense body, forced smile, and hands in your pockets, you appear distracted. You sweat, bite the inside of your mouth, and look away. Openness: Your legs, arms, and hands are open and receptive. Your body and eyes are relaxed. You remove your jacket and unbutton your collar. Readyness (being poised for some action): You lean and point your body and eyes towards a specific direction. Your body is slightly tense as you prepare to stand up or grip something with your hands. Relaxation: With a relaxed gaze, open hands, and gentle gesturing, you appear unconcerned and happy. Your shoulders and limbs are hanging loosely. Your body looks tensionless, balanced, even sagging. Romance and Sexuality: With dilated pupils and a fixed gaze, you point your feet and hands towards the other person. You lean in while you seductively play with something in your hand, something sexually symbolic. You copy the other person’s body language, preen, brush your fingers through your hair, caress yourself, display your body and expose some part of it while pursing, touching, and licking your lips. Moving into the other person’s personal space, you brush by, gently touch, then caress the body. Submissiveness: You are very still. Your face is white, your chin turned down. Sweating, you smile with your mouth but not your eyes. You touch your face, tug your hair, offer your hands out with palms up, but then turn your head to look away. You hunch over, crouch, and curl up to make yourself small. Obviously the face, but also the hands, play a critical role in expressing emotion and mental states. These areas of the body are rich in nerve endings, and disproportionately large areas of the brain are devoted to processing information about what’s happening there, which attests to how important Mother Nature considers them in people perception. If you doubt the importance of the hands in expressing thoughts and emotions, consider the fact that a whole language, sign language, revolves around the pictorial shaping of the hands and fingers. Or the fact that some photography models specialize in hands. Or that there are hundreds of different hand gestures, like beckoning, the high-five, thumbs up, wagging a finger, handshakes, saluting, and flipping the bird. People clench their fists when angry, fidget with their fingers when nervous, and wave you off when they want to avoid you. As many fascinating photographs show us, people often use hand gestures while they are talking, sometimes without even realizing what they are doing. It's an interesting moment to take the shot. Some psychological studies suggest that such gesturing helps people access language and memory. As a general rule, it’s a good idea to pay attention to the hands when photographing people. Sadness: The eyelids droop; the inner corners of the brows rise; the corners of the lips pull down; the lower lip push up in a pout. Anger: Both the lower and upper eyelids tighten; the brows lower and draw together. Intense anger raises the upper eyelids as well. The jaw thrusts forward, the lips press together, and the lower lip pushes up. Contempt: As the only expression that appears on just one side of the face, in contempt one half of the upper lip tightens upward. Disgust: The nose wrinkles; the upper lip rises; the lower lip protrudes. Fear: The eyes widen; the upper lids rise, as in surprise, but the brows draw together. The lips stretch horizontally. Happiness: The corners of the mouth lift in a smile. The eyelids tighten, the cheeks rise; the outside corners of the brows pull down. Whether faces can express any more than these seven emotions is still a highly debated issue. As psychologist myself, as well as a photographer, I find it hard to ignore the many nuances of facial expression. Similar to the message clusters described previously, variations in the intensity of these facial expressions, along with different combinations of the seven basic patterns, communicate a wide range of mental states. What do people look like when they feel a mixture of happiness and sadness, or when their surprise slides into anger? It’s these more nuanced expressions that lead to fascinating portraiture photography. To accurately capture these subtle aspects of facial expressions, close-ups will work better, as will full face and ¾ view shots, as opposed to profiles. Angles and Lines: How do the lines formed by the person’s arms, legs, head, hands, and body interact with each other, other lines in the image, and the frame? Do they reinforce each other, as in feeling peacefully horizontal, firmly vertical, energetically diagonal, or do they compete with each other in interesting ways? Portrait photographers will tell you that shots are more appealing when the shoulders and head are at an angle to each other, as opposed to being lined up, which looks like a mug shot - unless, of course, you’re going for a mug shot effect that feels solid, direct and even aggressive, as in the body language of the “full face threat” when you confront someone head on. Shapes: How do the shapes formed by the person’s arms, legs, head, hands, and body interact with each other, other shapes in the image, and the frame? Consider the psychological meanings associated with those shapes. For example, circular formations of the body suggest unity and enclosure, as in hugging oneself - while triangular shapes imply groundedness, as in standing with feet planted wide and firm. But is there a diagonal line elsewhere in the photo that threatens to pierce the circle, or an indecisively curvy shape wiggling behind the subject with strong akimbo legs? Does a subject’s body and outstretched arm form a boxy, claustrophobic square with the frame, or perhaps a dynamically tilted triangle? Movements: As we noticed in the description of message clusters, body language can present movements of closing in, contracting, opening, expanding, crossing, coming closer, and shifting away. How do other aspects of the image influence these sensations – such as a receding perspective, the visual rhythm of repeating elements, bubbling bokeh, blur, and gradated changes in tone, color, shapes, and complexity? Do they supplement, balance, or contradict those movements? Tactile Sensations: We associate touching and tactile sensations with body language, like being stiff, loose, hard, soft, rough, smooth, and relaxed. Consider how textures in the image complement, balance, or compete with those sensations. The Environment and Symbolic Elements: Obviously, the environment will have a big impact on how we interpret the subject’s body language. A relaxed, reclining man with a dangling arm will strike us very differently when he’s lying in bed at home or on a bench in a crowded subway station. Also consider the impact of the symbolic elements in the image, such as a person curled up next to a small bicycle, a bright light shining behind a woman deep in contemplation, or a woman raising her nose as she walks by a fancy car. Post-Processing: In the post-processing of an image, think about whether you want to use effects that echo, supplement, or oppose the body language in the shot. A soft focus will enhance a moment of tenderness. High contrast will magnify an aggressive body. Will reversing those effects soften or undo the impact of the body language? Will it provide a curiously different viewpoint for interpreting the postures of the subjects? The body language of a single subject in a photo can be very intriguing, but things really start getting interesting when we see the body language of two or more people interacting with each other. When teaching my college course on group dynamics, I take shots of the students in their groups, sometimes asking them to create a particular pose for me, and sometimes capturing a spontaneous moment. While discussing the shots soon after taking them and later in the semester, we continually find ourselves amazed at how much the body language reveals about individual people, their relationship to other people, and to the group as a whole. It’s quite fascinating to discover that the photos taken early in the semester actually predict what will happen later in the groups, mostly because they capture subtle interpersonal dynamics that hadn't yet fully surfaced in the group's awareness. Listed below are some of the insights from our discussions. These observations might be useful to photographers who enjoy taking spontaneous shots of groups, as well as those who are posing subjects for a particular psychological effect. As we’ve discovered in my group dynamics course, even when you ask people to line up and form rows in a seemingly mundane “class photo” style, their body language and position in the group might reveal a lot. For all of these items below, consider how your viewpoint when you take the shot might capture some of these elements of body language, but not others. Did you include the important elements, or accidentally miss them? Timing is also critical in the ever-changing flow of group activity, so it’s a good idea to recognize and even anticipate when these elements of body language will appear. Personal space: We all have this invisible zone around our bodies that we consider our own personal space. Only people with whom we are intimate are allowed into this zone. When anyone else enters it, we might feel intruded upon or threatened. Think about the discomfort of being in a crowded elevator. In a photo of two or more people, can you see the personal spaces of the subjects? Does the size of the space vary for different people? Is someone inviting, tolerating, or trying to eject someone else from that personal space? Distance and Proximity: This overlaps with the idea of personal space. We can think of physical distance between people in a group as possibly indicating the degree of emotional closeness between them. Who is standing next to whom? What people are far apart? Generally speaking, the more physically close all the people are in a group, the more cohesive that group is. Orienting and touching: Touching, looking at, leaning, reaching, or pointing towards another person might also indicate intimacy, or the desire for it. Is the direction of this body language one-way, or reciprocated? Clusters: Every group of three or more people tends to have subgroups – i.e., people who feel more bonded to each other than to the other people in the group. In a photo you can often see the subgroups as clusters of people who are physically closer to, orienting towards, or touching each other. Sometimes you’ll see people positioned between clusters, as if they belong to and provide a link between those subgroups. Loners: People who feel less attached to the group, or have been overlooked, ignored, or ostracized by the group members, tend to stand off to side, lean out, or look away from the group. Position in the group: The position people assume within the group shot might reveal something about their psychological status in the group. More dominant or influential people tend to stand in front, in the center, or above others; more submissive or less influential people stand behind, below, or off to the sides. Standing above the group might also indicate protectiveness, as if the person is watching over others. Notice also if people arebeing crowded out of the shot, or are trying to squeeze their way in. What might that say about their role in the group? Group shape: The shape created by the group might reveal its psychological characteristics. Curves are relaxed. Straight lines and distinct rows suggest formality. Circles, as in a group hug, indicate unity. Triangular formations feel secure and grounded. Think of the classic “stable” family shot in which two parents are sitting below a child positioned between them. The parents provide the visual and psychological foundation of the family unit. Body contact: The way people look when they physically connect to teach other speaks volumes about their relationship. Hugs might look tentative with lots of space between rather tense bodies, or they might look as if the people are emotionally melded into one. Notice if the various elements of body language are consistent with each other when people connect physically. Are the arms, legs, hands, torso, and face all conveying the same emotion, or are they each saying something different? Is someone looking away when they are kissing? Is one arm hugging tightly while the other hangs limply at the side? If you’re shooting an event, consider the possibility that where people sit in the room reveals something interesting about their personalities. Teachers and public speakers often notice this. People who sit up front want to be close to the action or to the person in charge of the action. They don’t mind that others behind them might be looking at them. People who sit in the back might be the slackers who want to doze, the observers who like to get the big picture of what’s happening in the room, the suspicious types who protect their backs, or the people who want to avoid attention or attract it by being the rebellious heckler in the back of the room. Those who sit by the windows might be the daydreamers who like gazing into the wide open space outside, while those who sit by the door anticipate a quick exit. The shy people might sit somewhere in the middle of the group, hoping to blend in inconspicuously. Here are two simple strategies for deciphering body language in a photograph, including both the psychological meanings conveyed by the body language as well as the role it plays in composition. First, use your hand or a piece of paper to cover up some parts of the body while focusing on others. Cover the head to see more clearly how the body appears. Cover the body to focus on the facial expression. Cover the left side of the body, then the right... the top, then the bottom. Hide one person to focus on the other, or one part of the person to see how the other parts relate to the body language of the companion. Playing with these variations will help you concentrate your attention on specific areas of body language while also realizing how those parts relate to the whole. Also try examing the image upside down. That unusual perspective can help you notice aspects of body language that might have eluded you in the upright position. You might also try covering different parts of the image as described above while you look at the image upside down. And What About You, the Photographer? The missing ingredient in this discussion so far is you, the photographer. I’ve talked about the body language of people in a photo, and between people in a photo, but what about the subjects’ body language in relation to you and the viewers who experience the image through your eyes? The subject’s body language might target us with a strong emotion, invite us into the image, push us away, or seem oblivious to our presence even when it appears highly intimate, which places us into a voyeuristic position. If the subject is looking into the camera, the body language might seem as if it's expressing a thought or feeling about you, although more subtle posturing also indicates a connection to the photographer, like the body, hands, fingers, or feet pointed towards the camera. Even when subjects aren't looking into the camera, we sometimes sense their self-consciousness about being photographed. The body often appears tense. They might be pretending to look at something, but the blank expression in their eyes and on their face tell us that they are not actually seeing. In a very subtle way, their body language is not convincingly directed towards whatever it is they are supposed to be doing in the shot, because their attention is on the camera. Consider also your own body language during the shoot. Portrait photographers often discuss how interacting with subjects influences their poses. If body language has a subtle, unconscious effect on people, then why not use it effectively? For example, to help a subject relax, avoid your own anxious body language and assume a calm, receptive posture. Psychotherapists have discovered that if you mimic or reflect back someone’s body language, even in a subtle manner, that person will feel understood, which would certainly encourage a subject to allow a revealing portrait. Experimenting with body language possibilities in a playful way with your subjects might help everyone relax as well as open doors to interesting poses. Tyra Banks tells her models to push a posture or facial expression to its extreme limits, then pull it back. If possible, why not model that for the model? Activating body language activates emotions, and that’s what a good photo is all about. CLICK THE IMAGES for comments about them. Body language in a class about Group Dynamics. This book is mostly written about body language in the worlds of business and politics, including such things as how liars gesture, what leg positions reveal, smiling, and interpersonal attraction as reveal through body language. Take it with a grain of salt, as not all of this information has a scientific basis. It's based mostly on the experience of the authors. Nevertheless, this book will give you lots to think about when taking and looking at photos of people. Unlike other books about body language, this one really is based on rather extensive psychological research. The authors discuss many photos that illustrate variations of the basic facial expressions of emotion: happiness, fear, anger, surprise, disgust/contempt, and sadness. They also describe the ways in which people might try to hide this emotions in their face, as well as exercises for understanding your own facial expressions and those of other people. 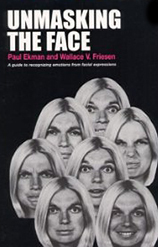 This is an excellent book for learning how to identify the obvious and sublte emotions expressed in portraits. The information might also come in very handy when coaching subjects to express emotions when taking photos of them. 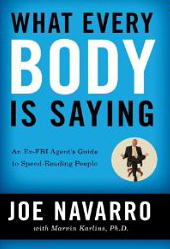 Written by a former FBI counterintelligence officer and an expert on nonverbal behavior, this book attempts to educate the reader on how to quickly assess other people's honest and deceptive emotions as expressed through body language. As with the Pease book, it offers lots of fascinating information that photographers will find very useful, although it should be taken with a grain of salt. The information indeed comes from experience "in the trenches," so to speak, but has not been scientificially validated. From a scientific point of view, we must question whether the body language of people in the world of crime, politics, and business accurately reflects the body language in other social situaitons. Based on his experiences as a psychoanalyst who used family photographs as way to help his patients better understand themselves, Akeret developed a system for interpreting the hidden, unconscious “language” expressed in images. 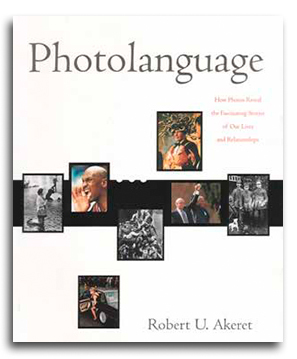 In his earlier book Photoanalysis and in this more recent sequel, Photolanguage, Akeret applies his techniques to the interpretation of photos of both everyday people and famous figures over the past century, including Adolf Hitler, William F. Buckley, Frank Sinatra, O.J. Simpson, and Jodie Foster. Based on a careful analysis of subtle body language, dress, and context, his conclusions about the unconscious emotions and motivations of the subjects is nothing short of mind-boggling. Trained as a psychoanalytic psychologist myself, I find his books absolutely fascinating. To be honest, I wonder how much of his interpretations of what he sees in photographs are based more on a kind of post-hoc Monday Night Quarterbacking as opposed to a truly objective analysis of the subjects. Nevertheless, I highly recommend this book for anyone who enjoys understanding the nuances of personality styles as conveyed in photos.